consciouness, but Motion Picture Story Magazine stayed on after she dropped off the screen. 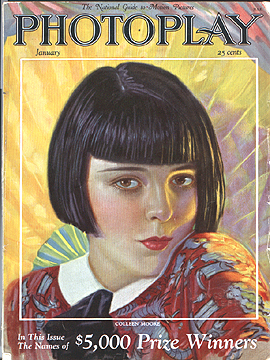 Motion Picture Story Magazine was followed by a plethora of other publications, such as Photoplay, Film Pictorial, Modern Screen, Motion Picture Classic, Picture Play, Screen Book, Screen Secrets, Screenland and Silver Screen. Such magazines contained carefully-controlled publicity pieces, most of which served two aims - to bring the audience at once closer and further from the stars. The reader was supposed to feel awe at the stars - take a look at Adolphe Menjou's wardrobe. The buttons of his waistcoat and his studs were of jade and diamonds. His very smart cigarette case was of thinnest gold and opened like an envelope. His watch was wafer-thin, of platinum, edged with sapphires and monogrammed A.M in tiny diamonds. The stars were not only beautiful and well-dressed - they had land, in the form of beautiful mansions, complete with formal gardens and swimming pools. Movie magazines presented almost feudal tributes to their ostensible "subjects." We sat in the garden of her beautiful home in Beverly Hills, awaiting luncheon. Portraits and motion pictures had been made; Miss Shearer had taken an active interest in the proceedings and her mother had paid a call. The Chinese yardman had gotten his instructions, bowed low, and was now sprinkling the flowers. Yet a star could not get too far from the star-watchers - otherwise awe might turn into resentment. Stars also "shared" ordinary activities with their readers - there were arranged photos of actors and actresses "at home." Magazines such as Photoplay would also carry columns bringing tips on etiquette, diet, beauty, and fashion, linked with features on the stars' wardrobes and their health routines. 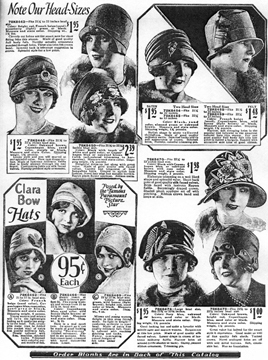 cloche hats for the Sears and Roebuck winter catalogue. It is in these snug bowers that the "domesticity" the fan magazines so lovingly and so lyingly prattle of is revealed of in its true form. Here the veneer assumed for box office purposes vanishes-- The language of the gutter resumes its place as the mother tongue-- a space is a spade or even a harder name--passion is mad passion and nothing less. Not surprisingly, such magazines existed to feed the "dark side" of fans' obsession. The urge to see idols fall was just as strong as the call to worship.